Glen Arden Receives Approval from NYS for Fee For Service Contract! The Glen Arden community has always been known for the array of options offered to their residents and they are the only continuing care retirement community (CCRC) in the Hudson Valley. Most recently Glen Arden was approved by New York State to offer Fee for Service contracts, giving them every contract option NYS has to offer! 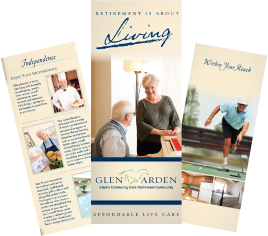 Glen Arden’s full compliment list of continuing care retirement community contract options lets their residents choose from every contract NYS has to offer. This allows the residents to choose a CCRC contract that best pairs their healthcare needs with their healthcare plan. The most recent Fee for Service option has the most affordable monthly service fees with all the amenities. This option allows the resident to receive priority access to the Enriched Housing Unit and Health Care Center at Glen Arden on a fee for service basis. Along with all the benefits, this option guarantees that a resident’s estate will be refunded 90% of the entrance fee upon the cancellation of the residency agreement, regardless of the length of time he or she lives at Glen Arden. The Fee for Service contract option is ideal for residents with long-term care insurance. If this contract is not for you, there are plenty of options to help fit within your financial budget. These contract options all have their own benefits giving you access to Glen Arden’s continuing care community. Planning for an affordable worry-free retirement is the start to a worry-free life. Contact us at 1 (800) 914-4051 or online if you plan on joining the Glen Arden community. Schedule an appointment to learn more on why Glen Arden is the only choice for you.